1.Construct of High Hardness Tungsten Carbide,Excellent Scratch Resistant Performance,Longer Using Time. 2.Width 6mm,Nice Weight,a Solid Choice for Most Men and Women. High Polish Smooth inner face, Bring you both the Elegance and Comfort. 3.Durable and Weighty Tungsten Carbide. 5.Strict Quality Control and Individual Package. 6.We always believe that simple is nice,comfort is the most important. Made of high hardness tungsten, 100% scratch resistant and durable. Tungsten Carbide is one of the most durable metals in the world. Tungsten Carbide Rings are a revolutionary breakthrough in jewelry technology. It is durable and scratch resistant. This metal is very heavy and hard. Tungsten Carbide is 10 times as hard as 18Kt gold, 5 times as hard as steel, and 4 times as hard as titanium. Tungsten carbide is between 8 and 9 points on the most hardness scale, with a diamond being 10. 3. Mark the spot where the paper meets and measure the length of it. 4. Use the chart to determine your ring size. NOTE: Make sure the measurement you choose easily fits over your knuckle. 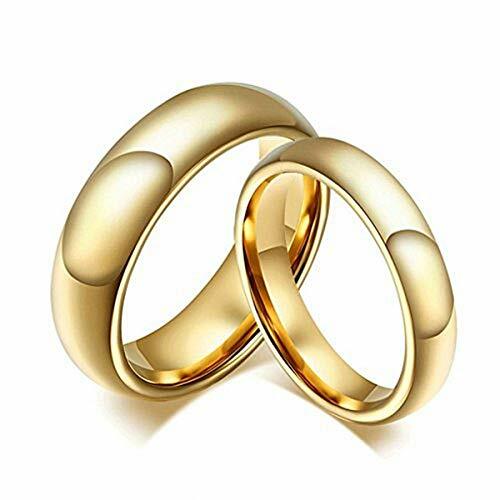 6mm Domed 18K Yellow Gold Plated Tungsten Carbide Ring,Perfect as a Wedding or Engagement Band for Men or Women.We know you will love our sharp and elegant design so it makes a perfect choice for your ceremony and its unisex style will appeal to both the bride and groom. Thinking of buying it as a gift for your husband or wife? Brother or sister? Mother or father? We pride ourselves in being leaders of sleek, slick, and modern ring designs that can serve as token of love for your union, or matrimony, either as a matching set or simply for his or hers. These Rings Come in a Small Size Gift Box! save your gift wrap service fee, and help you store the ring much safer and longer. Buy any two rings sold by Domilina (including the same styles' different sizes), get 10% off. If you have any questions about this product by DOMILINA, contact us by completing and submitting the form below. If you are looking for a specif part number, please include it with your message.